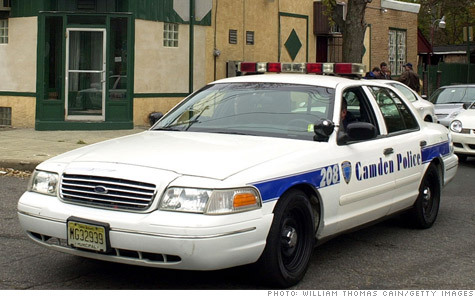 NEW YORK (CNNMoney) -- There will be fewer cops patrolling the streets of Camden, N.J., come Tuesday. Struggling to close a $26.5 million budget gap, the city with the second highest crime rate in the nation is laying off 163 police officers. That's nearly 44% of the force. And Camden will also lose 60 of its 215 firefighters. Some people with desk jobs will be demoted and reassigned to the streets. The mayor's office says that the cuts will not affect public safety. "We're still going to protect our residents," said Robert Corrales, spokesman for Mayor Dana Redd. Public safety "will remain our top concern. We'll shift our resources to be more efficient with what we have." But police and firefighter union officials say the layoffs will most certainly have an impact. "It's absolutely physically impossible to cover the same amount of ground in the same amount of time with less people," said John Williamson, president of the Fraternal Order of Police union in Camden. "Response times will be slower." Even if it takes only a few minutes longer to respond, it could mean the difference between life and death or between catching the bad guy or the bad guy getting away, he said. And if the city had a major fire, it could tie up all its resources, said Al Ashley, president of Fire Officers Local 2578 in Camden. It would be forced to rely on its suburban neighbors for help. Camden is far from the only city to slash its public safety budget, though its cuts may be among the deepest. Newark, N.J., shed 167 officers in late November, leaving 1,133 on the force. Some 25% of cities said they were cutting their public safety budgets in 2010 to deal with shortfalls, up from 14% a year earlier, according to an October survey by the National League of Cities. The slashing in Camden comes after city officials and the public safety unions failed to negotiate concessions that might have avoided some or all of the layoffs. The mayor was asking the cops and firefighters to pay more for their health care, freeze or reduce their salaries and take furlough days. The unions responded with concession offers of their own, but the two sides could not come to terms. Police officers and firefighters have worked without contracts or raises since 2009 and 2008, respectively. The moves will save the city about $21.5 million. The rest of the deficit will be made up through a 24% spending cut in every department, a 3% hike in city taxes and increases in various fees. Non-union city workers will have to take 26 furlough days. One local business owner, David Brown, said he was anxious to see how the cuts unfold Tuesday. "I don't understand how you can do more with less," he said. "I don't want to be a pessimist, but I can't be optimistic." CNN's Nina Golgowski contributed to this report.